Gualtiero is currently working in Washington DC at the National Oceanographic and Atmospheric Administration headquarters on both wet- and dry-side strategic issues, with support of a Knauss Marine Policy Fellowship. In awe of the sea and the blue planet’s beauty, and intrigued by society’s dependence on and management of ocean and water resources. He completed a PhD at MIT/WHOI, researching connections between monsoon rainfall and upper-ocean dynamics in the Indian Ocean. Scott is currently an Associate at McKinsey & Company in Washington D.C. working in the Operations Practice. Scott graduated from the Leaders for Global Operations (LGO) program in 2017 with his MBA and Masters in Mechanical Engineering. Scott's previous experience includes Brewing and Logistics at AB-InBev and Operations Research at Sanofi-Avantis Deutchland. He hopes to continue efforts focused on global water challenges as his career progresses. Isadora is a PhD candidate in urban studies and international development, focusing on urban water supply governance and sustainable water resources management in the Global South. Originally from Brazil, she holds a Bachelor’s degree in Political Science from the University of Brasília and a Master in City Planning from MIT/DUSP. Prior to MIT, Isadora worked as a research assistant at the Institute for Applied Economic Research in Brazil on projects about public participation in policy development. She has previously served as Co-Vice President (2015-2016) and Lecture Series Chair (2014-2015) of the MIT Water Club. Alexis Fischer is a Ph.D. candidate in Biological Oceanography in the MIT-Woods Hole Oceanographic Institution Joint Program. Her research focuses on harmful algal blooms (“red tides”) , and in particular how warming temperatures will affect the timing and intensity of blooms. She is interested in entrepreneurship and finding solutions to problems at the intersection of public health and water resource management. Matthew Willner served as Co-President of the MIT Water Club during the 2015-2016 school year while he was completing his Master in City Planning degree. Currently, Matthew serves as a Fulbright-Clinton Public Policy Fellow in the Independent State of Samoa, where he is working within the Ministry of Natural Resources and Environment of Samoa to support climate resiliency efforts on the island nation. Before attending MIT, Matthew was a congressional aide in the offices of U.S. Senator Edward J. Markey (D-MA) and the U.S. House Committee on Natural Resources’ Democratic Staff, where he supported legislative work pertaining to foreign relations, energy, environment, transportation, and LGBTQ human rights. Matthew is passionate about bridging the divide between the enormous spatial and temporal scale of climate challenges and the political incentives of our democratic system. Peter was a founding member of the MIT Water Innovation Prize in 2015 and became Director in its second year. While at MIT, he was a founding member of the MIT Hyperloop Team and researched microfluidic manufacturing with Dr. David Hardt. He founded WalkSmart in 2016 and is located in Grand Forks, ND. He grew up in Salem, OR and attended the University of Portland. Leo obtained his Ph.D. from MIT’s Department of Mechanical Engineering in 2016, where he worked on models and experiments for increasing the energy efficiency of reverse osmosis and other water treatment and desalination systems. Leo is currently an Associate at McKinsey & Co., where he aspires to help large organizations to become more environmentally sustainable. Neha is a graduate student in the Technology and Policy Program at MIT and currently pursuing research in the field of wastewater treatment in oil and gas industry. Prior joining MIT, she completed her master’s at University of California Berkeley in Chemical Engineering. Later she joined a California start-up developing membrane system for water purification. At MIT, she has been actively involved in organizing panels and lecture series related to water research and energy. She is also founder of MIT start-up Samperk, which aims to provide clean drinking water in rural India. Liz likes to connect people and make things happen. 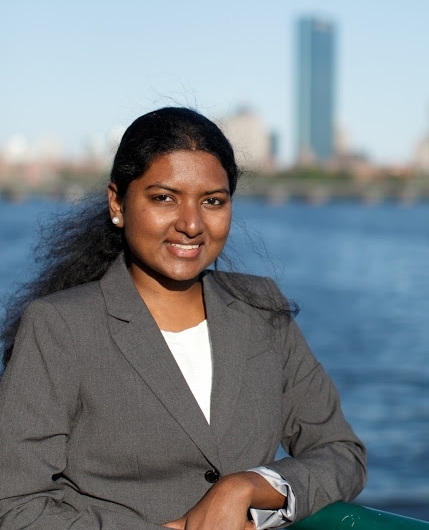 She founded the MIT Water Innovation Prize, with the support of the MIT Water Club, in her first year as an MBA student at MIT. In addition to her love for the MIT Water Club, Liz is an active member in MIT's energy and water entrepreneurship world, for both current students and alumni. She has served as Sector Practice Leader for energy and water with the Martin Trust Center for MIT Entrepreneurship, and was a TA for the popular course, Energy Ventures. Prior to her graduate degree, Liz lived in China for five years, adventuring and working at the engineering consultancy Parsons Brinckerhoff. She has experience in startup enablement, program management, corporate sustainability, and green buildings in China. Liz holds a Bachelors in Science from Northwestern University in Environmental Engineering, International Studies, and Engineering Design. David Cohen-Tanugi obtained his Ph.D. from MIT’s Department of Materials Science & Engineering in 2015, where his research focused on developing novel classes of membranes for water desalination. Since graduating, David has been working as a co-founder of Embr Labs, a startup that is developing new technological solutions for thermal comfort.